The world of interchangeable jewelry has grown so much over the last few years – and I absolutely love it! Few things beat finding that “perfect piece” to add to your collection that you can change over and over again to match whatever you are wearing that day! Ever since I discovered Style Dots – a company specializing in interchangeable jewelry, handbags, and accessories – I have loved the flexibility of owning just a few statement pieces but giving them dozens of looks to match my wardrobe. Independent Style Dots Consultant La Rae Moncada sent in one of those statement pieces for the Christmas in July Gift Guide, and quickly became my go to piece! La Rae sent in a Style Dots Bling Statement Necklace which comes on a 17″ faceted ball chain with 3″ extender. 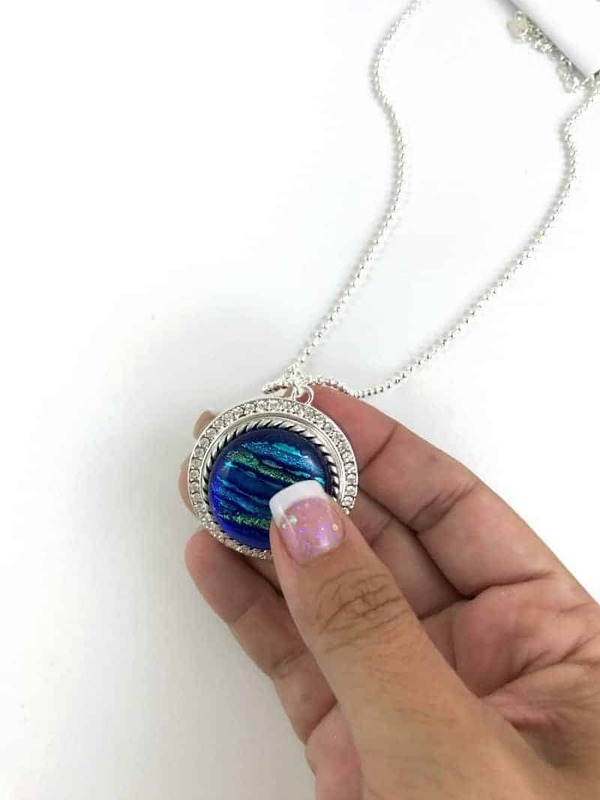 It is 36mm diameter so it holds one of their Statement Dots – which there is over two dozen to choose from AND one that you can even personalize with your very own photos! How cool is that!? La Rae sent me the Blue Dichroic Statement Dot which is a beautiful deep blue but also has hints of green and yellow and gold – a photo could never do it justice. With Style Dots you just simply snap your dot right in place and you are good to go! Style Dots offers an impressive line of jewelry, handbags, accessories, shoes, and even sunglasses – all of which you can change up with more than 100 Style Dots to choose from! You can shop online right through La Rae’s website, or host a party to earn free and discounted products by sharing this fun and fashionable company with your loved ones. If you want even more, consider joining La Rae’s Style Dots Team to build a business with this ground floor company making headlines with their unique fashion forward products! Check out her website to learn all about how you can get involved with Style Dots!